Donnie Priest was just 10 years old when the plane his stepfather and mother were piloting slammed into the side of a Sierra mountain during a huge winter storm in 1982. Donnie, sole survivor of that crash, was barely alive when rescuers discovered the plane buried beneath the snow. Though he recovered quickly, both his legs had to be amputated. In September 2007, Donnie reunited with members of the team that saved his life for a hike to the scene of that crash. SYNOPSIS: A group of hikers gathers for breakfast at Tioga Pass Lodge at the edge of Yosemite National Park. They have come to hike with Donnie Priest who, in 1982, was inside a plane piloted by his stepfather when it crashed into the side of a mountain near here killing both his mother and stepfather. After days of searching, Donnie was found alive in the wreckage and now, twenty-six years later, he has invited members of the team that rescued him to hike back to the place where their lives first intersected. Donnie’s legs were amputated as a result of his ordeal and the hike up to the crash site proves too daunting for him. Several times he falls and has to reset his prosthetic limbs. Upon arriving at a plateau below the crash site, Donnie and his companions stop, rest and recall the events of Donnie’s ‘miracle’ rescue. 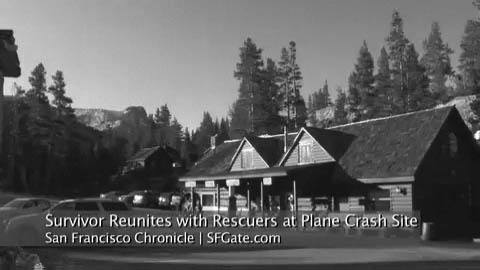 Related article: Emotional Trek to Sierra Crash Site.